David Ortiz, who said Sunday that he’d consider playing for another organization if the Boston Red Sox don’t give him the contract extension he wants, told WEEI.com’s Rob Bradford on Wednesday that he only asked for a one-year extension to his current deal. In other words, Ortiz, who already is under contract for 2014, wants the Red Sox to sign him for the 2015 season — not a long-term deal. Ortiz drew some criticism for the comments he made Sunday, as many pundits viewed it as the 38-year-old complaining about his current deal. Ortiz said on Wednesday’s WEEI podcast, however, that he wants to sign a one-year extension so that he doesn’t have to face questions about his contract status during the Red Sox’ 2014 World Series title defense. Ortiz said Wednesday that he and the Red Sox are on good terms, and the slugger expects to engage in negotiations with Boston relatively soon. As far as his comments about playing elsewhere, Ortiz told Bradford that he was responding to a hypothetical scenario in which the Red Sox didn’t show any interest in retaining him. “I heard a comment the other day that came through the news about me saying that I’m going to go somewhere else. People sometimes take the wrong message. I was asked if the Red Sox don’t want to offer me an extension, then what am I going to do? I’m not going to retire. I’ll go somewhere else,” Ortiz said Wednesday. “Whoever offers me a contract, that’s where I’m going to be. "It’s not a secret from no one that I want to be part of this organization. This is where I want to play. But it’s a business. You’re not supposed to be mad at no one. You just do what you got to do, you take what they give you and in the worst case, they don’t offer you a contract and you go somewhere else. Those are the exact words I said. I don’t think I said anything wrong. 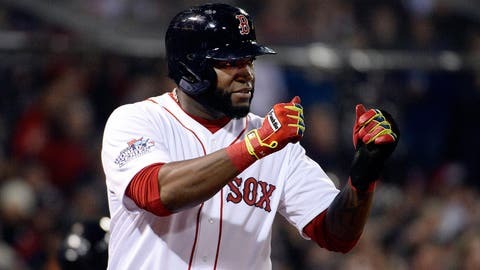 Ortiz, whose 2012 season ended prematurely because of an Achilles injury, is coming off a strong 2013 season in which he hit .309 with 30 homers and 103 RBI in 137 regular-season games. The nine-time All-Star then produced in the postseason (again), leaving many to wonder if/when he’ll ever slow down. Ortiz currently is preparing for what he hopes is another “monster season.” But while Big Papi would like some clarity — whatever that entails — regarding his contract status before Opening Day, he thinks this whole situation seems to have been blown out of proportion.